When you get a 1up, pause the game as the 1up sound is playing. This will cause the background music will keep playing even though the game is paused. Questions & Theories: Will this same glitch occur when other items are picked up? 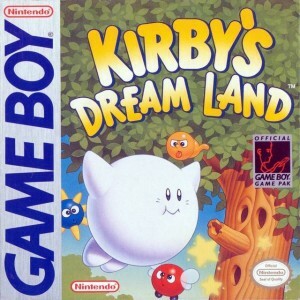 Unknown Causes: The common glitch found in many games where under certain circumstances, enemies will not spawn or render when moving off the screen also happens in Kirby’s Dream Land. View this part of a video to see this glitch. This glitch is hard to reproduce and is known to only work sometimes or randomly. In Castle Lololo, in the room with the bomb, when you enter, the Booler (Ghost) will fly up and back close to the bomb. Inhale both of them at once. You’ll know the trick worked if Kirby spits out the Booler, but the bomb still goes into Kirby mouth, and Kirby is then normal, with nothing in his mouth. The bomb disappeared, right? Not quite. Inhale another enemy, and spit it out, and it becomes the bomb. Or you can inflate, and spit out the air, which also can become the bomb. On the Sound Test, let any music except 1-5 or 13 play for about 3-5 minutes. An instrument track will stop playing from the current music. You can transfer this to another song (except 1-5 or 13) by going to that music and pressing A. Press B or play 1-5 or 13 to undo the alternate music. When you first start the game, walk straight into the first Waddle Dee (don’t press anything else, just walk), and a different sound will be heard than when you normally get hit. In level 4, in the cloudy room with the small area of water, go to the small area to the left of the water (there’s a secret door there, but don’t go in). Then walk as far off the cloud as you can (without falling into the water), and quickly turn around and walk back. If you did it correctly, you’ll hear a splash sound, your movement will be slower, and Kirby will be behind the background. After beating Kracko Jr. and grabbing the Warpstar, you will fall out of a waterfall. While falling, inhale the Mint Leaf to the left, so that you get it the moment Kirby hits the water. Then fly out, and Kirby will now be behind the background. View this part of a video to see this glitch. by Kirby’s Rainbow Resort (Source) and romscout (Video). In level 4, in the cloudy room with the small area of water, go to the small area to the left of the water to find the secret room with a Mint Leaf. Fall down the hole while inhaling the Mint Leaf. If done correctly, the Mint Leaf/Spicy Food song will play for a second, even though Kirby died. When you start the stage again, you will still have the Mint Leaf ability.